As I was grading written assignments today and dutifully filling out a standards spreadsheet for students, I was feeling pretty good about my feedback. Then, I went back to some assignments I had previously read – blog posts that I was planning to send to a colleague to put up on a blog. I realized that students had not taken any action on my feedback. In most cases, I would not realize this, and might even accept it, but in this case with the products going public, I wanted the corrections made. On other written assignments, students have the choice to revise and resubmit for a higher grade. Occasionally on a big assignment I require a rough draft be submitted and then revisions need to be made before the final submission. Now that I have paused to think about it, I realize that I type the same comments over and over. Some student writing is improving, but not enough for the effort I put into reading the work and providing the feedback. There is a disconnect between what I readily state as one of my goals for my classes, strong analytical writing, and the effectivess of the support I provide for students to reach that goal. What I would like to do is to declare one class per cycle (one of every six classes) as a writing workshop. I know that how we spend class time tells our students what we value. I value writing skills but almost all student writing occurs outside of class or in a class setting that resembles a testing situation. Neither of these is really conducive to thoughtful work on the craft of analytical writing for history. I will ask the students which class out of the cycle they would like to dedicate to writing, and then ask them how we might structure the time to be really useful for them. I could see students using the time to work on revising an assessment. I would also love to see students work on practicing skills where they are weak, such as topic sentences. It could be organized as quiet independent work with me providing individual support as necessary or it could be a whole class or small group activity. It may not always be the same. There is some danger here that we will fall behind on “content” but I hope the tradeoff is stronger writing and better thinking about history that comes when students work on their writing. It really is about the learning and what best supports the learning. Moving towards standards-based grading is a step, but I think that structuring my class time differently also matters. It is time to make sure that the skills I hope I am teaching get integrated into class, in a way other than formal assessment. I hate February. I always have. There is a malaise that lingers in the air. This year I decided to ask my US history classes, “How can we make February awesome in history class?” My two classes approached this question differently, and so they are on two different paths. In a thematic class, it doesn’t matter. Both classes are more engaged than they would have been otherwise, although there is not much common to what they have done, except the theme of the unit – Foreign Policy. Each class came up with a list of things including bringing food to class and having a Monday Funny (a humrorous short video clip on a Monday to brighten the mood – a tactic used by a beloved science teacher). In terms of approach and content, one class, my D block, decided they wanted to look at the Cold War from three perspectives – American, Soviet, and Chinese. They self-selected into those groups. We generated a list of topics to look at, and they began researching those perspectives. That took two classes. Then we began the discussion. It has been interesting to see what they have been able to uncover. One early takeway was the difference in the way WWII impacted the reality and the thinking of the Soviet Union and the US. My role was to fill in gaps and to draw out the key points students were making for larger discussion. The other class, B block, had trouble coming up with a common topic or approach. They asked me what D block had decided and then recoiled at the thought of debating the Cold War. They defaulted to letting me put forth some plans. So in B block, we spent a day on the wars of expansion in the 19th century. Students could choose to work on researching and creating a short five slide, one minute presentation on either the question of “Was the Mexican-American War justified? And what did Texas have to do with it?” or “Was US government policy toward Native Americans genocide, ethnic cleansing, or something else?” They self-selected their groups and got to work. Since they are creating Ignite-style presentations for their individual project in this unit, the short slide-show was good practice. After that, we spent the next two days working on a timeline of events leading up to WWII, placing the events on a spectrum based on whether they moved the world closer to war or closer to peace. This set of plans worked for this class, but I think the fact that I asked them what they wanted to do and showed willingess to accomodate them made a difference. They were my plans, but student approved. We began this Foreign Policy unit by looking at the case study of US-Cuba relations, which was in the news at the time. Tracing that relationship from the late 19th century until today enabled us to examine a variety of different scenarios and all of the tools in the US Foreign Policy toolkit. We then spent a few days looking at the history of US use of economic sanctions. Students wrote about when they think that economic sanctions are a good idea. So, there was a common base with both classes before we diverged. All of these choices were made possible by a thematic approach. I could use a topic in the news to examine US Foreign Policy historically. I could capitalize on student interest to allow them to design part of the unit. I could choose topics and activities of interest to the students. There are definitely gaps in coverage, but I think that there are always gaps in learning. Just because we cover does not mean anyone learns it. 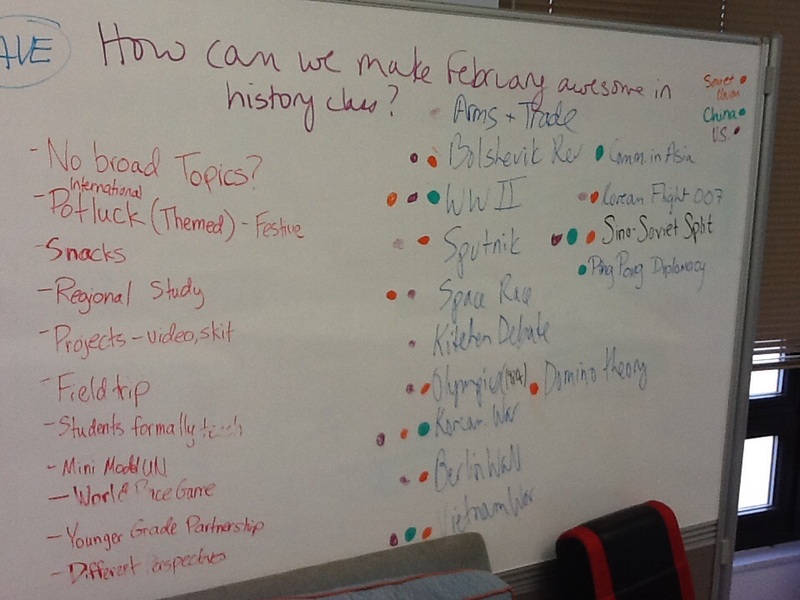 I think the best part of this thematic approach is that when I ask my students how to make February awesome in history class next year, I will be able to honor their answers, too. Next year’s Foreign Policy unit may be quite different depending on current events and current students.